The little building is a copy of a Victorian storefront in Northern California! The front is hinged, so that the interior is enclosed, cutting down on the dust. The unit is lighted on both floors, and self contained, operating from a coin cell battery and on off switch cleverly hidden under the roof for quick access. Height is 6" Width is 4 1/4" Depth 4 1/4" not including base. 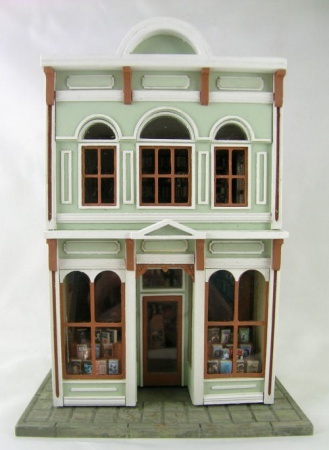 This shop displays beautifully with our clock shop, dress shop, quilt shop and hat shop in 1/4 scale. This building is the most detailed facade I have attempted yet, and I am happy to say it was worth every bit of the effort. The multiple layers of woodworking on the front are just beautiful. 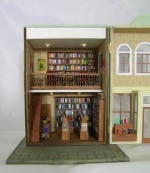 The interior has two floors, the main floor with lots of shelves full of books, a cash register counter, and staircase up to the second floor. The second floor has additional books, but also a lovely table and pair of wing chairs to create a little reading area. Nearly 600 tiny books fill the shelves, and each are printed with a full cover cover and spine. No, they do not open, and yes, they will be easy to make. Vintage book posters adorn the walls and add a bit of color. 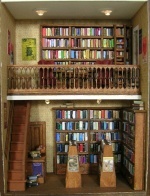 You'll even find a tall library ladder on wheels to reach that top row of books! Our motto "If it's in the photo, it's in the kit" applies to this kit. You will provide paint, stains, glues, sealers and basic tools. A pair of Easy Cutters are very highly recommended for this project. If you don't have a pair, they are available on our website. Everything you see is included, and you will have access to an extensive online tutorial with photos and written instructions for each and every step along the way. Delivery of this kit is scheduled for the end of February. Please make note of this. I always get emails from customers shortly after ordering wondering where their kit is. The kits are assembled and shipped all at one time, AFTER registration closes. Classes always sell out quickly, so don't delay, this is one project you will NOT want to miss out on! See below for additional photos, and email if you have any questions!